"There is an urgent need for adequate regulation to curb predatory pricing and capital dumping in the ecosystem in the interest of co-existence of all players in the ecosystem," Pranay Jivrajka, chief operating officer of Ola, was quite vocal in his criticism of what the cab-hailing service's 'unnamed rival' is doing to distort the taxi service market through disruptive pricing using foreign capital. However, according to a section of investors in digital businesses, Ola would do well to analyse its own marketing strategies and capital structure. "There is absolutely no merit in Ola's complaint. We are an open economy and FDI is allowed in many areas. We have chosen the path and the world will come and invest. We must compete. If you can't beat a highly competitive company, you just can't cry and go to government saying this has happened," said TV Mohandas Pai, angel investor and co-founder of Aarin Capital. Mahesh Murthy, co-founder of Seedfund, termed Ola's cry for protection as "hypocritical." He questioned Ola's concern about the foreign capital. "This is such a silly joke. Apart from a few shares owned by some Indian boys from IIT Bombay, Ola is as foreign a company as anyone else. Its last equity investor was Scottish. The one before that was Russian. The one before that was Japanese. The one before that was American. Who is Ola trying to fool by suddenly becoming flag-waving nationalist bhakts?" asked Murthy. "Ola is not funded by the Indian capital to go to government and ask for protection," said Pai. "Look at the irony—here are two foreign-owned companies slugging it out for the control of the Indian market and one of them claims to be Indian and goes against complaining the other," he added. And they do have a point. An analysis of VCCEdge data shows the domestic capital in Ola is just under 20%. The complaint about predatory pricing too sounded baffling as Ola too adopted discounting as a strategy to win customers. A VCCircle analysis has found that the company spends Rs 3 for every Rs 1 it earns, thanks to the huge discounts that the company is offering to customers. 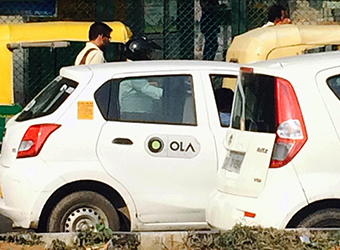 According to sources close to the firm, Ola's monthly burn is around $30 million (Rs 200 crore). "Ola is also playing the same game. Many taxi companies and individual taxi drivers are feeling that Ola is beneficiary of capital dumping, throwing them out of the business," said Pai. "Just two weeks ago, Ola CFO and I were on a panel with Meru CEO, and Ola CFO declared that their pricing was not predatory compared to Meru and that they are profitable on over 90% of their routes where they charge around Rs 12 per kilometre and that they are sustainable as a business at this level. Suddenly in 10 days, all the numbers have apparently changed on their spread sheets," said Murthy. According to Pai, Ola should approach Competition Commission of India (CCI) if it finds the rival indulges in uncompetitive perverse pricing. "There is a legal mechanism. They must try and prove it by data," he said. To Ola's credit, according to Murthy, Indian consumers have benefitted from the competition the cab aggregators have created. "Just two years ago, we had no alternative to the mafia that ran the black and yellow cabs and autos. Now it is a pleasure to see that mafia disintegrate". However, he believes uncompetitive businesses should die. "As far as India is concerned, I believe uncompetitive businesses deserve to die; and if the black and yellows can't compete with Meru, they should disappear; and if Meru can't compete with Ola, they should disappear and if Ola can't compete with Uber, they should disappear; and if Uber can't compete with someone else, they should disappear too," he said. Jivrajka, however, reiterated his position that it is competition, not Ola, which engages in predatory pricing. "Dumping capital in key markets to lure drivers and inflate their wages significantly, that is where the predatory pricing comes into play. Competition even today, three years into the business in India, is selling every ride way below the cost," he said.